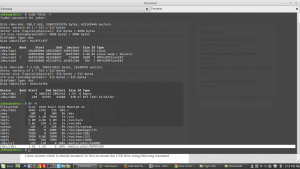 How to create bootable USB with terminal in Linux machine ? Yea there is no need of any other software for formatting and making bootable USB from ISO file. you can simply use your terminal program and complete the task. Some time other software may failed or returned error while making bootable usb, but this should always work. First you have to format the USB , you can simply use the following script for formatting the USB make sure you choose exactly same partition other wise you may format your other partitions or dual booted OS. Then you will find a result something look like below image and make sure you identified your USB drive letter from the result. Now simply choose any of the following command to format the disk based on your preferred file system type. for bootable FAT is used commonly. Once the formatting is complete now you can make the bootable USB with terminal , with single command. First make sure your ISO file path , and USB drive letter. the syntax is as follows. How to make bootable USB with terminal command ? NOTE its sdb not sdb1, It will automatically pick the correct partition just make sure you didn’t connect more than one USB device at this time. Once the process complete you will something like below. Yep its that much simple to create bootable usb with terminal in Linux there is no need of any other software. Easy project deployment for web applicat..